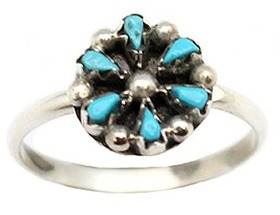 This small sterling silver ladies ring is made with 7 pettipoint turquoise cluster stones. It measures approximately 3/8″ in diameter and is handmade by Zuni artisan Tricia Leekity and or Trudy Kallestewa. Size 7.